For those that know me, they’ll probably spit out their mouthful of tea into their Cheerios when I mention the words ‘exercise’ and ‘me’ in the same sentence. Yes, not naturally known for seeking out most forms of physical activity, it has come as somewhat of a surprise that over the last 2 weeks, I’ve subscribed to ‘Strava’ and have achieved more than 17 miles in recorded exercise this week alone. Bet you weren’t expecting that. And in all honesty, it’s come as a slight surprise to me too. Now, before we get too carried away – it’s only the end of week 2, and I wouldn’t say it’s formed part of a habit just yet. I’m also conscious that snow may only be just around the corner and when it does arrive, it’s here for a whopping 4 or 5 months at least. So, I’m taking the initiative, and spending time getting some brisk walking under my feet and revelling in the stunning scenery that I’m not used to being so blessed with just on the doorstep. Literally, there’s no excuse, and it would be a travesty if I didn’t. 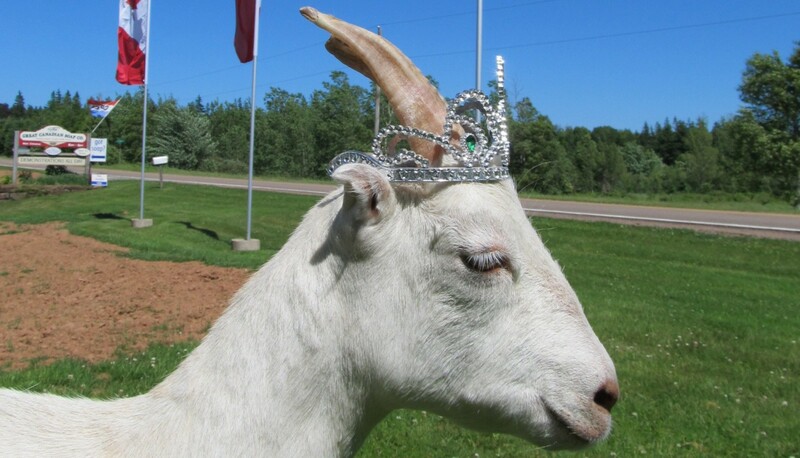 So, back to Strava. It’s quite clever all this modern technology malarkey. I go into the ‘app’ on my phone when I start walking, and press ‘stop’ when I’ve finished – couldn’t be simpler! It maps my route, tells me how far I’ve walked, where I’ve been, and I can upload pics along the route too. The only thing it’s lacking is the ability to provide a cup of tea at the end of my efforts ….. For some of my routes, it even compares me to others who have walked the same segment and gives me a ranking. I’d like to say I’m not competitive in the slightest and that this doesn’t interest me at all. But I’d be lying. It’s extremely addictive, and has me to the point of seeing if I can beat my average pace per mile each walk I do. I’m up to a ‘brisk’ walk – not just any old saunter or stroll, but a good walking pace – just short of those who do ‘race walking’ and waddle like constipated chickens. That’s a bit too advanced and certainly not for me. Chickens can rest easy in the knowledge that I’ll be stopping short of adopting that pose. I’d rather run – and that’s an insight into how mad things have become in such a short space of time. I know! I’m unrecognisable ……. So how’s my body reacting to the onslaught of muscles being plied into action, I hear you ask? Well, last week I was walking like an 85 year old granny, but I’ve picked up since then and my body has readily acclimatised to the flexing of muscles. It’s been a shock to the system in the literal sense as well as the metaphoric. I’m finding the glass or two of red wine in an evening tends to balance things out quite well. Purely for medicinal reasons, you understand …..
And there are loads of people doing the same. The variety of people I pass on each and every route is astounding, and the numbers of people capturing some form of exercise is positively motivational. Everyone says ‘hello’ – it’s just like being back home in the North-West in terms of friendliness. I love that. It’s much better than strangers just passing like ships in the night, with no acknowledgement or recognition of another human being. I can’t ignore people, and I’d need to be in a coma before I do. Q: What’s the difference between a buffalo and a bison? A: You can’t wash your hands in a buffalo ….. 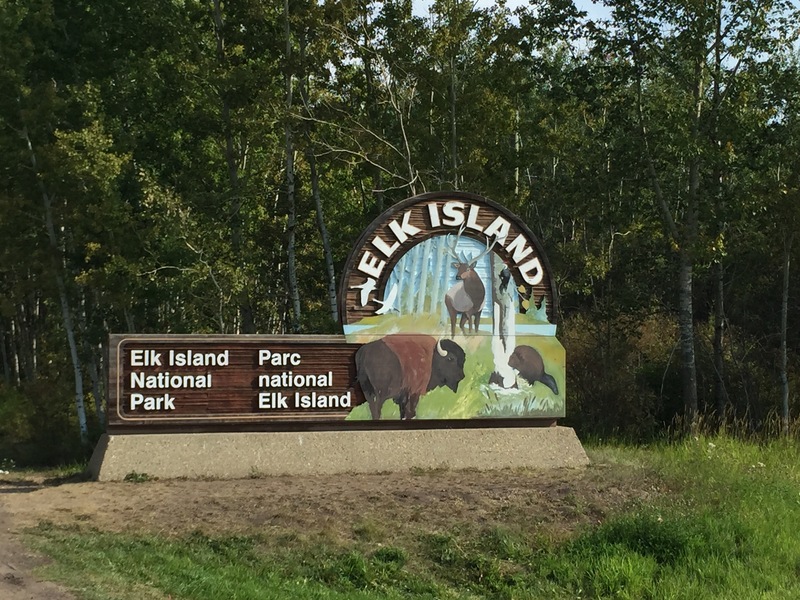 So, my chosen destination was Elk Island National Park. 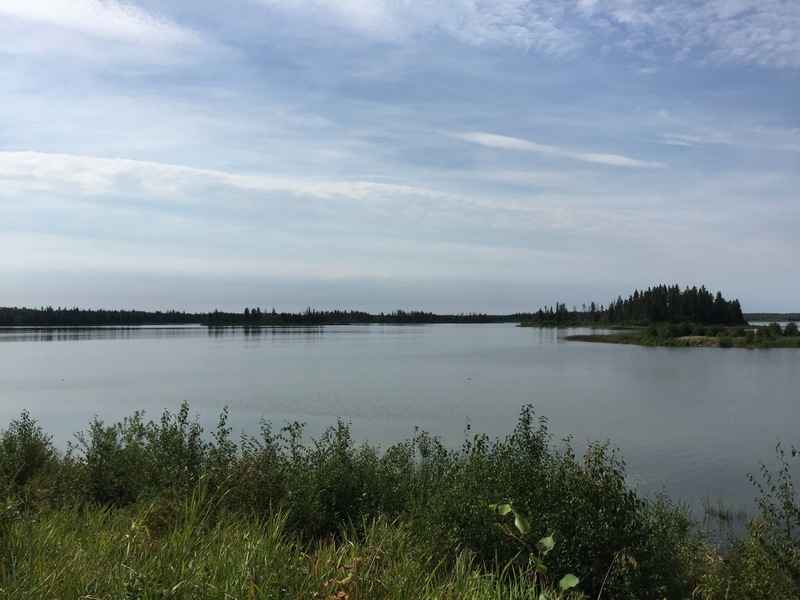 We’ve never ventured anywhere to the east of Edmonton, and this is just 35km outside the city, taking just under an hour door to door, to get there. It’s one of 43 national parks and park reserves in Canada and also Canada’s only fully fenced in national park, home to North America’s largest land mammal; the wood bison. In fact, the wood bison is on the threatened species list with numbers having diminished to extremely low levels, and the park has been one of the most influential organisations in re-establishing bison not only in Western Canada and the US, but has contributed to growing bison herds all over the world. 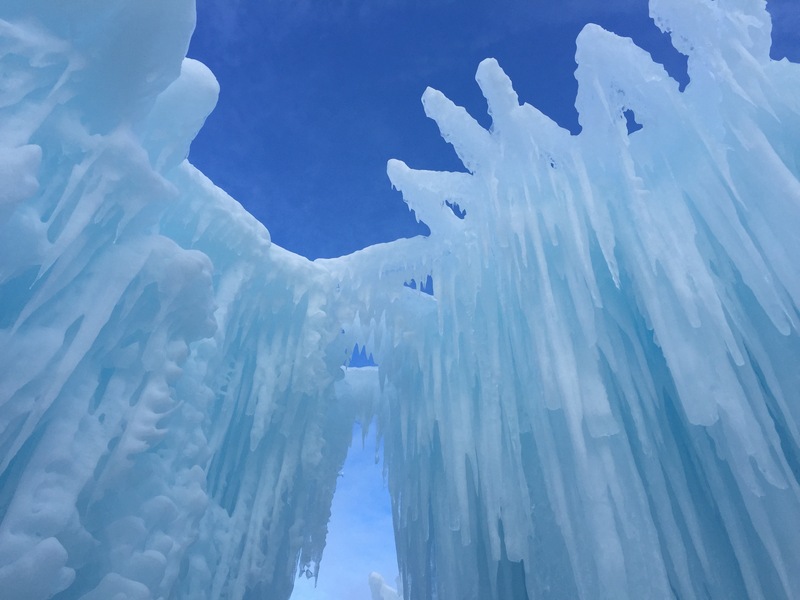 The park was originally founded in 1906 as a wildlife refuge for the preservation of elk herds in the area, and since then, has grown to be a wildlife sanctuary for bison, moose, elk, white tail and mule deer, beaver, porcupine, Canadian lynx and other small animals. It is home and a migratory stopover to 250 species of birds, including pelicans, great blue herons, a large assortment of ducks, and birds of prey … bald eagles, great horned owls and osprey. 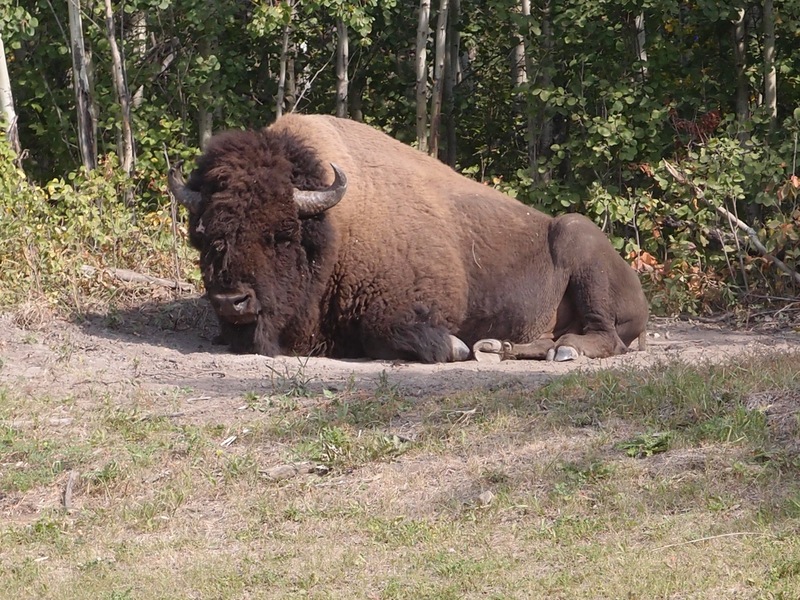 After the African Serengeti, Elk Island has the 2nd highest population density of grazing animals in the world. Bet you didn’t know that! Most of them however, were elusive in their absence today. We toured the park, took the instructions from the park wardens on where to go to spot the herds, but alas, all we saw was one huge male bison having a relax in the sun (see above!). 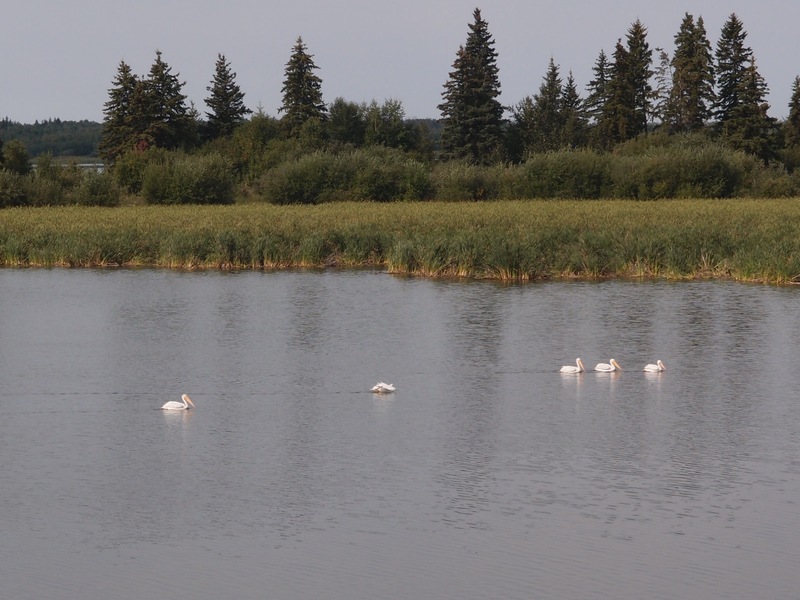 That said, we did spot lots of beaver dams – minus the beavers themselves …..
… and we also saw 5 pelicans – which we weren’t expecting so this was a bonus! The views across the lakes were fantastic, and at 75 square miles, the park has ample enough space to accommodate those that venture this way. It wasn’t busy in the slightest – but I don’t think I’ve ever come across anything in Canada which can be classed as ‘busy’ the way it is back home in the UK. 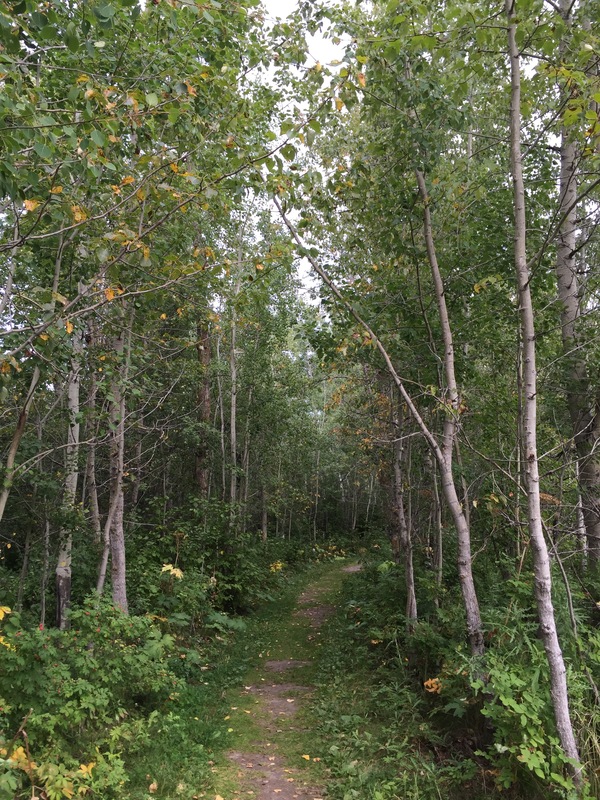 Lots of different trails to explore, all of varying distances and across assorted terrains. We took a 3.5km walk on the Beaver Trail which was through woodland and along tracks which saw us back at the truck in just under an hour. We need to venture back, as there are longer treks – some 16.5km in length which will take you further into the park and present a much higher chance viewing animals and wildlife living there – but obviously, take a longer duration in time to complete. The best time to visit being early in the morning or at dusk – not at mid-day when all my brood had eventually got themselves dressed, organised and finally ready to get out of the door! 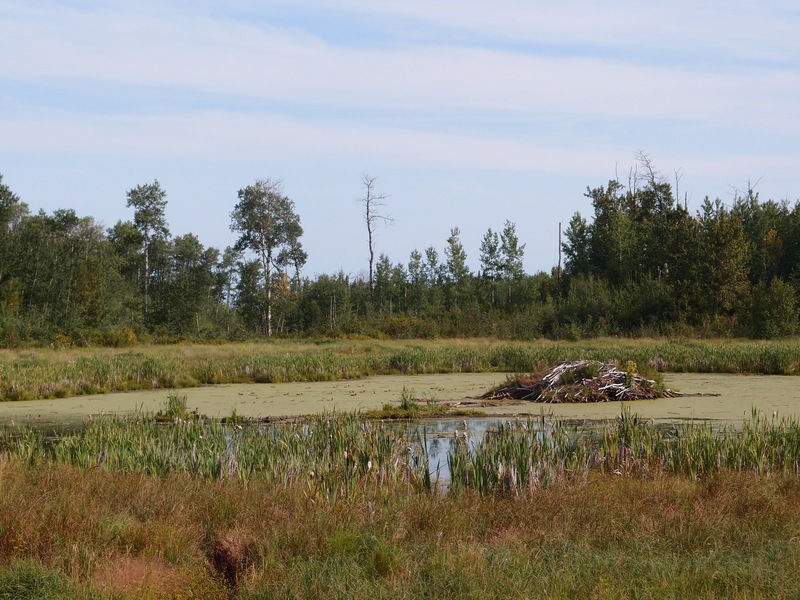 Most interesting, is that the park is also home to Beaver Hills Dark Sky Preserve – one of only 7 dark sky preserves in Canada, and dedicated to maintaining dark skies. In fact, The Royal Astronomical Society of Canada use the site to observe the night sky, and the public is also welcome to attend – as long as ‘night sky etiquette’ is strictly observed. I can just imagine trying to get my husband to abide by this – I’ll have more chance getting the kids to do as they’re told! That said, I’m frequently receiving nightly alerts informing me of the chances of seeing the ‘Northern Lights’ in the Edmonton area, so given the Dark Sky Preserve is so close to us (in relative terms), we’ll go for a night viewing of the sky at some point and hopefully, spot in full colour, the Northern Lights. Let’s hope. I’ll let you know how we get on! An obscure title for a blog, I know. 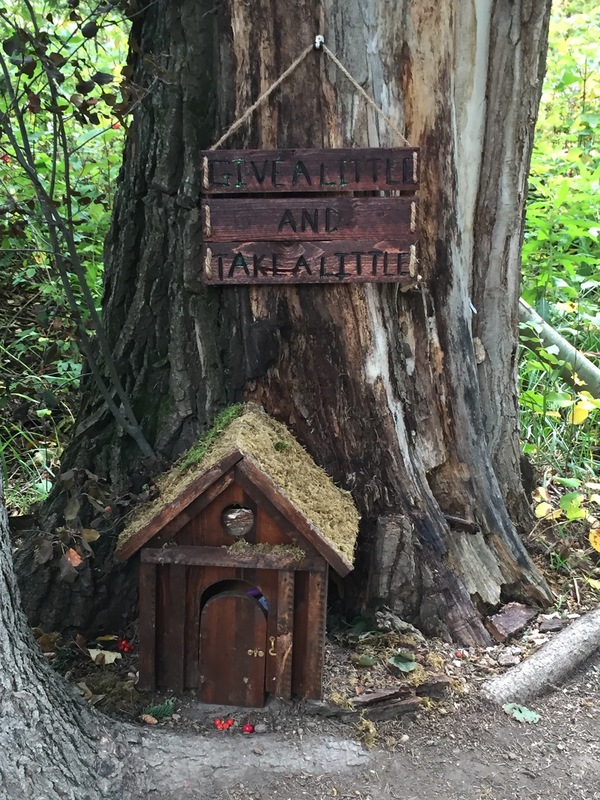 You’ll have to read on to appreciate the significance …. 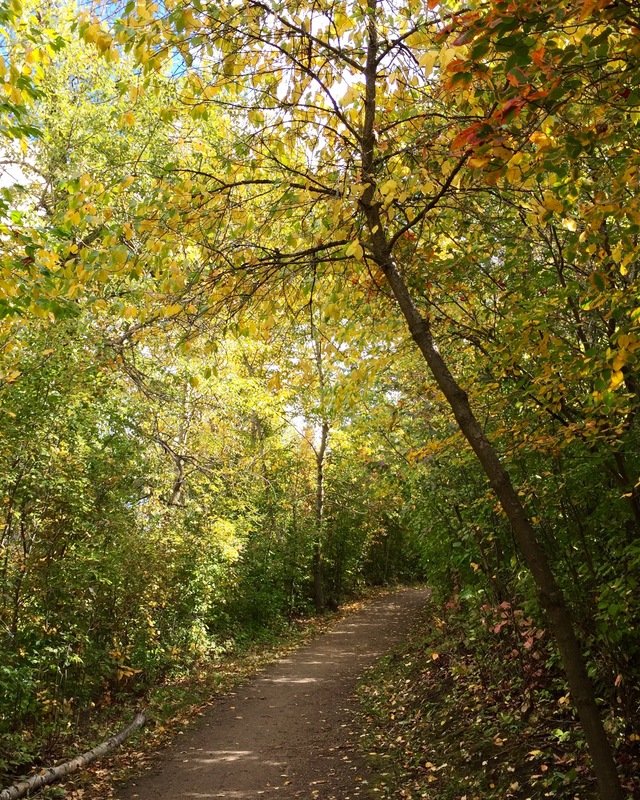 I’ve mentioned on numerous occasions the abundance of walking trails available to explore throughout the River Valley. These are prolific and having so many on the doorstep means you’re always stuck for choice on where to explore next. 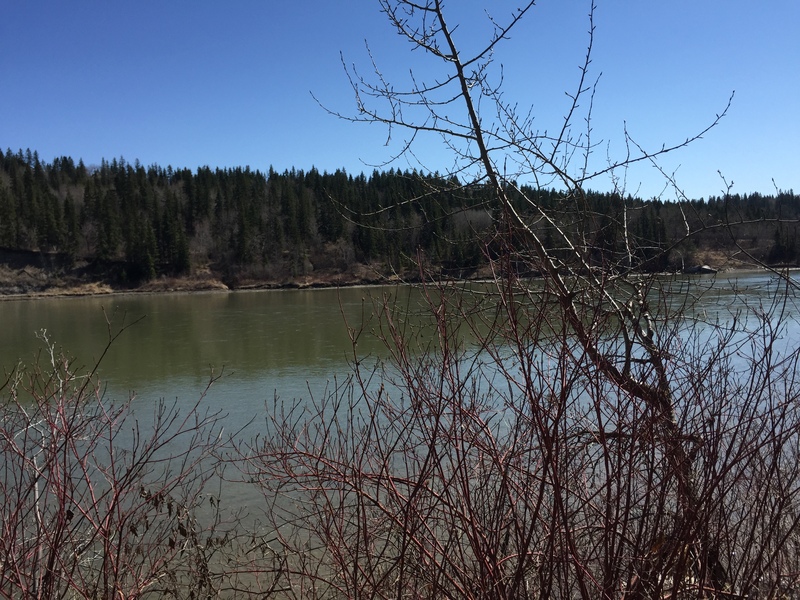 The River Valley cuts through Edmonton and can be accessed on either side of the North Saskatchewan River through 22 parks and over 150km of trails. 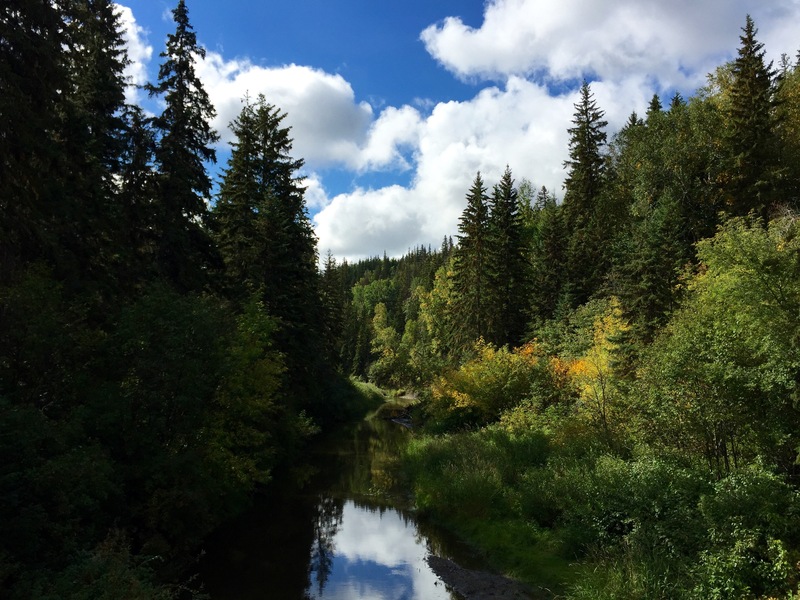 You may think that on a day (well, it’s been a full week in fact), where the weather has seen blue skies, sun, and temperatures in the late 20’s and early 30’s, setting out on a walk in the River Valley will have you exhausted and flagging before you exit the car park. Not so. In fact, it’s absolutely ideal as down on the valley floor and alongside the river, nature has created the perfect canopy of coverage and protection from the strong rays of the sun, leaving you cool and collected as you trample through the trails. 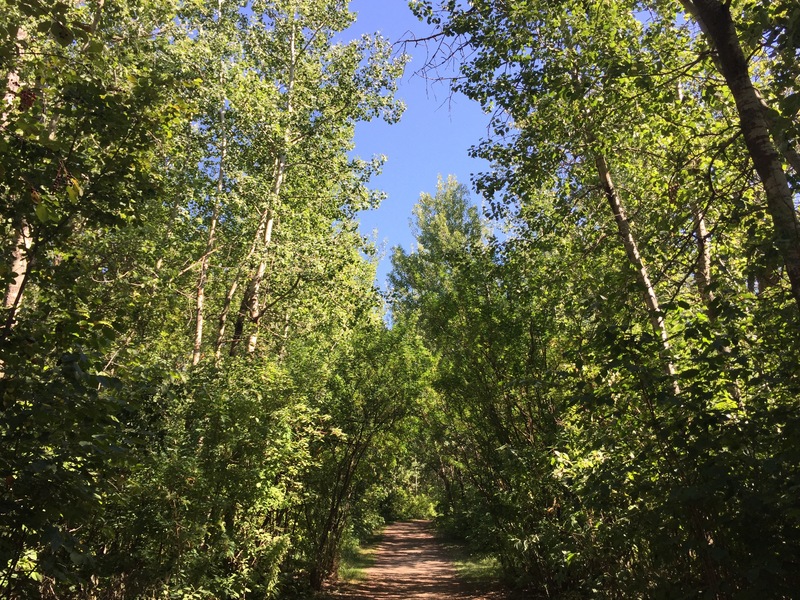 We opted for a walk from Emily Murphy Park (named after a Canadian women’s rights activist who lived in Edmonton, and became the first female magistrate in Canada and the British Empire). Whilst there are lots of routes to take, we opted to take one down through the trails and alongside the river towards the High Level Bridge. It’s a case of ‘make it up as you go along’, but it’s not overly complicated if you’ve the nose of a bloodhound and remember to always keep the river to your left 🙂 As the trails are used by both walkers and cyclists (cross-skiers in the Winter too, but luckily, we’ve a few months to go just yet), keep to the right hand side otherwise you’ll get mown down in the rush – they are certainly well-populated with people taking their daily exercise. Not surprising too, as down in the shade it must be a good 10 degrees lower …. As you get closer to the High Level Bridge, it’s an impressive iron structure standing at 152 feet above the river and half a mile long. Opened in 1913, it was the first bridge in Canada to carry four different modes of traffic – rail, streetcar, car and pedestrian. The latter three are all still utilised, although the rail has a newer bridge now which runs alongside the High Level one. I guess out of necessity, there’s also signs and an emergency telephone as you walk onto the bridge which quickly sober you up. The kids hadn’t seen anything like this before and it needed somewhat of an explanation that lasted for the full duration of the walk across. Still, creating distractions are my thing and getting the kids to look at the view, to notice the streetcar above us on the highest rails, and the noise of the cars driving past were all proffered up for their consideration. The view on a day like today was truly stunning. In recent years, a ‘Light the Bridge’ initiative has seen 60,000 LED bulbs inserted into the bridge and every night it lights up in an array of different colours. The colour schemes vary, and a schedule of each evening’s colours is circulated by the City of Edmonton at the start of each week. This is based on requests made to symbolise different events which are going on in the city during that week. The kids love driving over the bridge and seeing the different colours, which can also been seen from afar. It’s beautiful. As you walk onto the pedestrian path across the bridge, there are some quotes which have been set into the concrete pavement and unless you passed on foot, you would miss them. See what you make of this one which is just as you enter the bridge …..
Super, aren’t they? Completely thought-provoking and inspirational. It’s been a great day. We set out to enjoy the scenery, get some exercise, and spend time together as a family – that’s what weekends are for and we certainly achieved that. 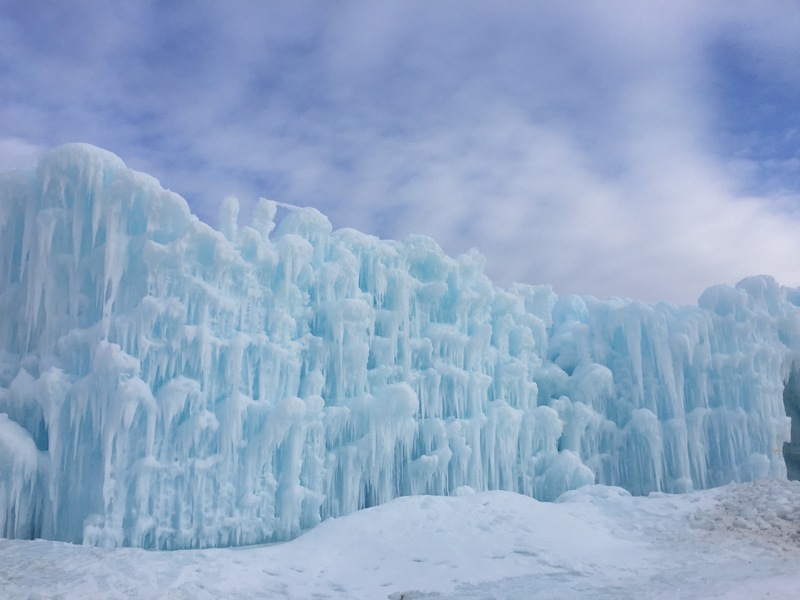 What it also made me do was to reflect on the quotes above and our aspiration to make the most out of each day we spend, trying something new, and doing something fun. I think we’re doing it. There could be worse things in life than adopting such a philosophy I think. It’s Spring in Edmonton – the sun is out, Canadian geese are arriving and the grass is returning to green – and we’ve been out exploring. 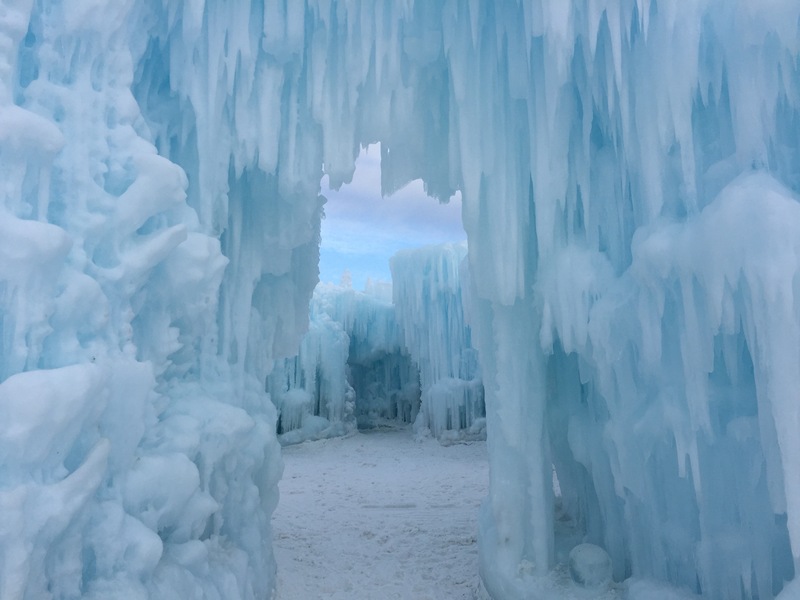 In fairness, we’ve been exploring since we arrived but the snow does impose some limitations on our ability to go for long walks and take in the scenery. 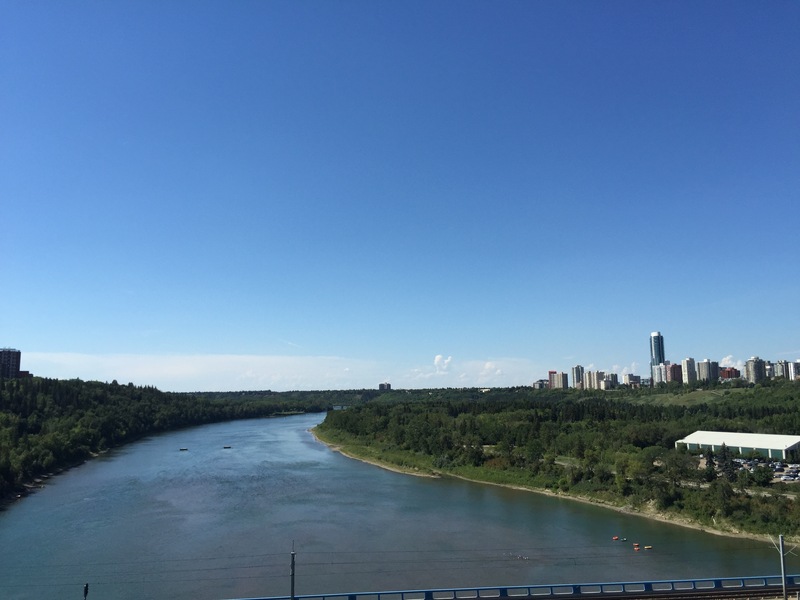 So we’ve been out investigating the delights of the Edmonton River Valley …. Here’s a few facts for you. 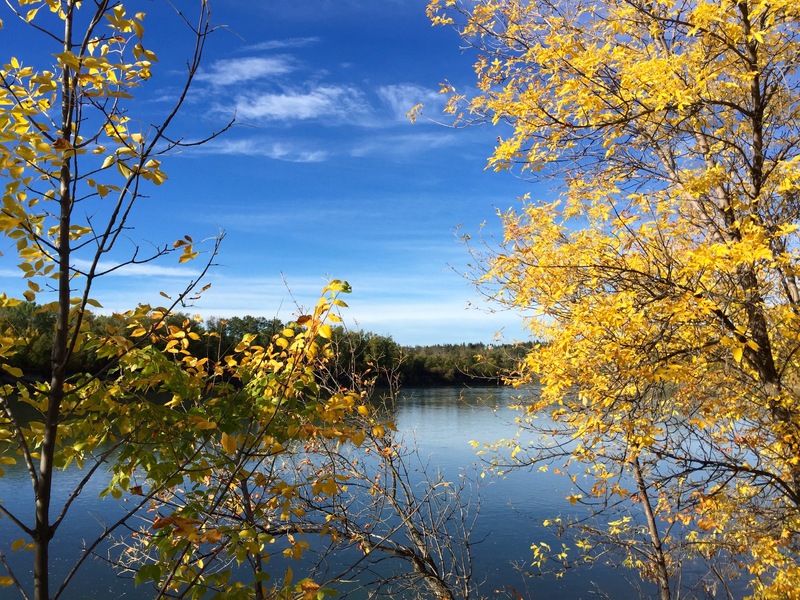 At 7,400 hectares, Edmonton’s North Saskatchewan River Valley is the largest stretch of urban parkland in North America. 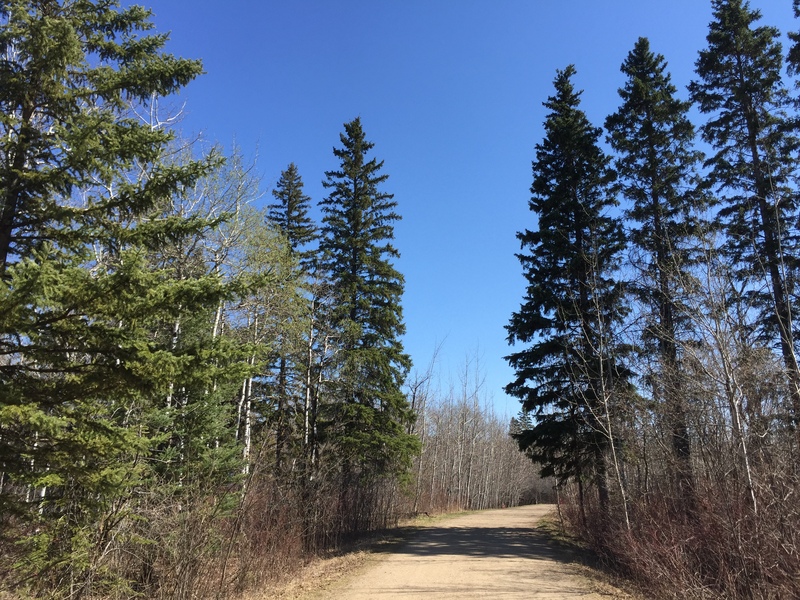 There are 22 major parks and over 150 kilometres of trails on which you can enjoy walks, bike rides, picnics, snowshoeing, cross-country skiing and lots more. 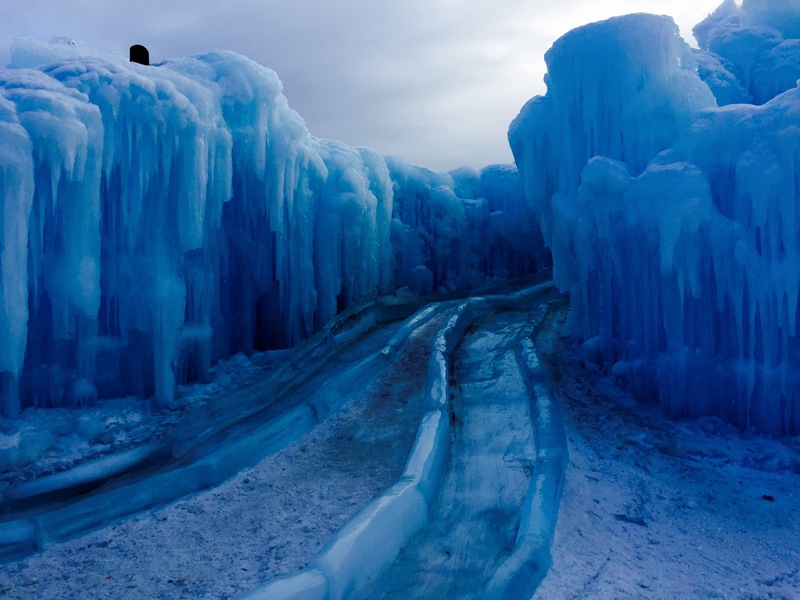 Built into the River Valley are major attractions like the Edmonton Valley Zoo, Fort Edmonton Park, the Muttart Conservatory and the John Janzen Nature Centre. 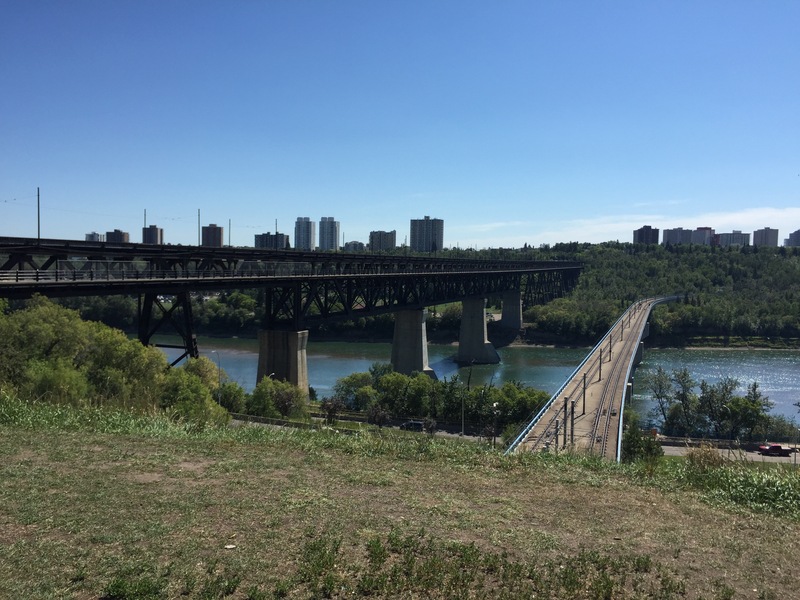 On top of that there are both public and private golf courses set into the River Valley, plus four downhill ski slopes – two of which are within the city and two immediately outside. It’s not called the River Valley for nothing. 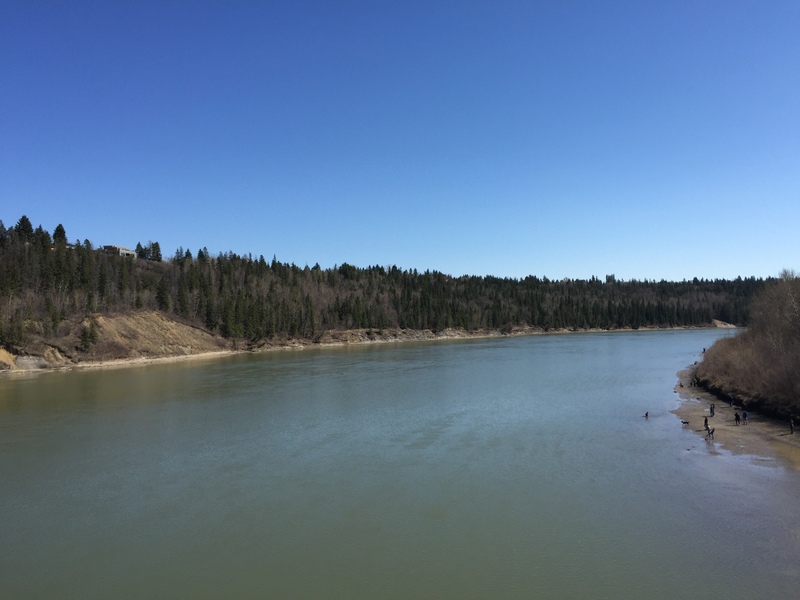 The North Saskatchewan River is a glacier-fed river that flows east from the Canadian Rockies to central Saskatchewan. It is 800 miles in length and winds in a northeastern direction through Edmonton. It originates 1,800 metres above sea level in the massive 325 sq. 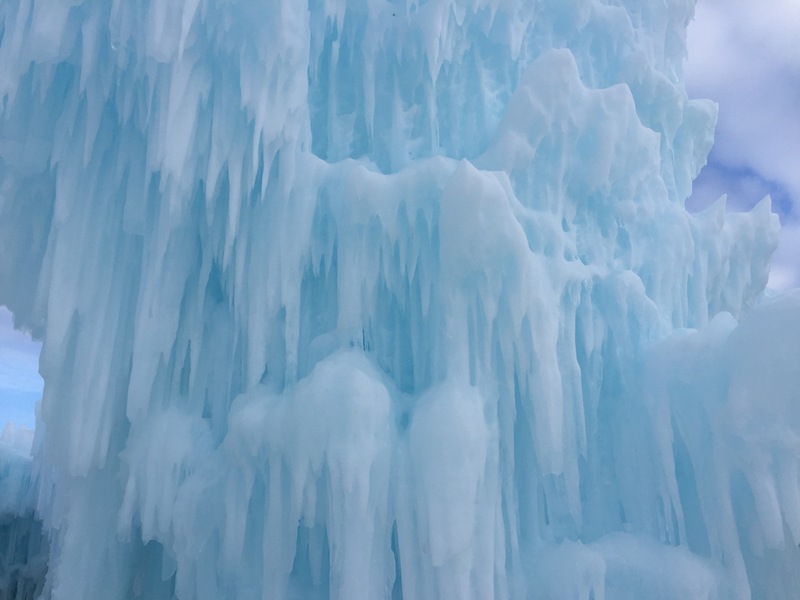 km Columbia Icefield in Banff National Park, before flowing across Alberta and Saskatchewan to Lake Winnipeg, into the Nelson River and eventually into the Hudson Bay. 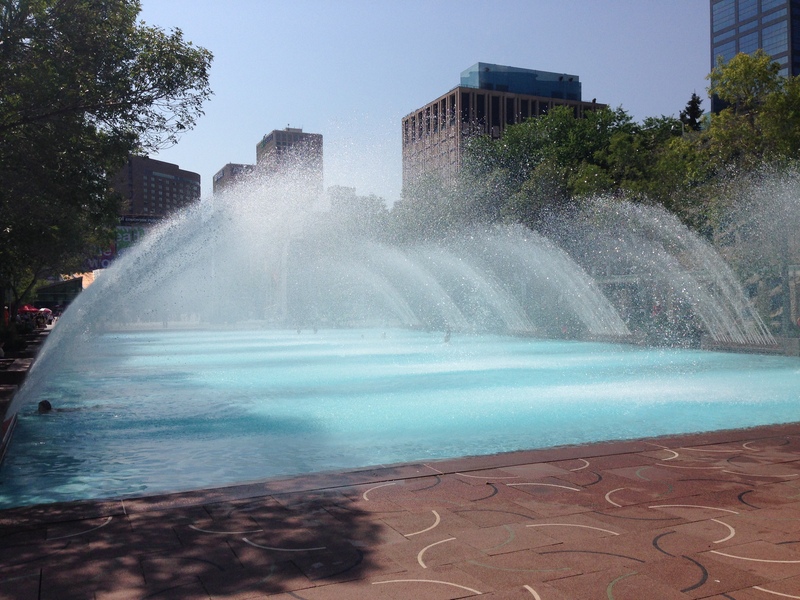 It also is accountable for supplying Edmonton and surrounding communities with drinking water. The banks of the river are wide, and the colour of the river a bluey-green which looks magnificent amongst the many coniferous trees, blue skies and bright sunshine. 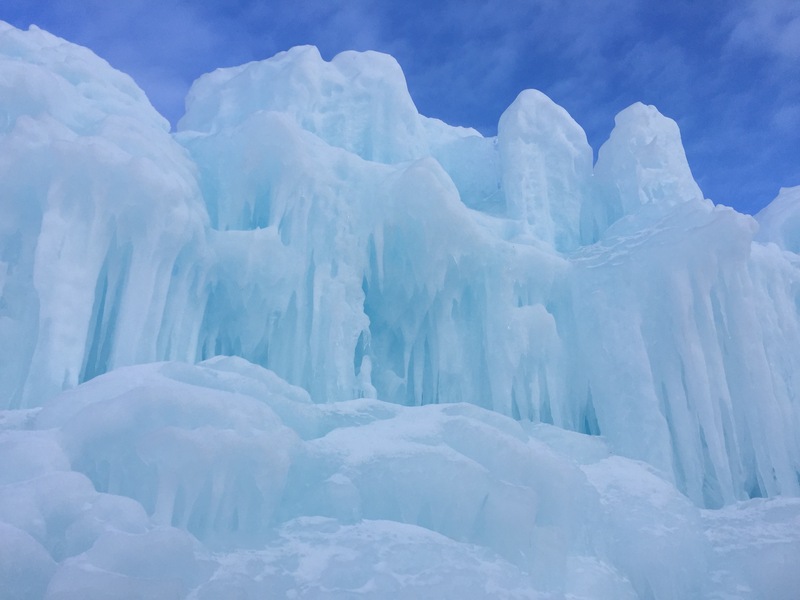 Whilst it’s been picturesque in the snow, it’s only since the snow has finally departed and the temperatures have started to warm up that we’ve started to explore this vast area. The sheer scale of the paths and walkways is amazing, and there are access points where you can park up, hop out and start exploring throughout the whole River Valley system. 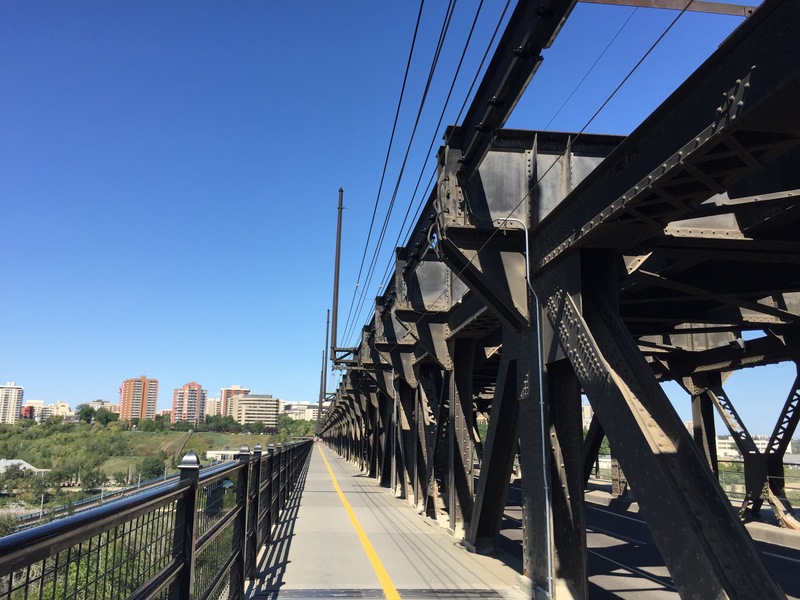 It’s cleverly designed too – encouraging access through numerous paths that connect across the valley to other parks, walkways and bridges enabling you to criss-cross the river. There’s also a tonne of thought that’s gone into making it absolutely accessible to anyone, on any mode of designed transport, whether that’s 2 legs, 4 legs (usually the canine variety but not necessarily limited to…), horse trekking, mountain biking, segways (yes, I’ve seen a few of those around too), skateboards, and scooters. With 22 parks, there’s ample large green spaces which are dotted with picnic benches and barbecues – some of which were in active use with families and friends this weekend. The smell as you walk past was extremely appealing. One family group had also brought a bouncy castle with them, plugged it into a portable generator and the party for kids was well underway. Games of ’rounders’, baseball and football were in abundance, and yet, only a couple of paces away you’re back onto the single tracks and paths along the banks of the river and it goes quiet again. Dogs seem to be one of the most popular pets and owners are out en masse in all the parks – some of which are ‘off leash’ areas and the volumes of dogs running around and generally having a great time was superb to see. Although, at one point I did wonder whether we’d stumbled into a ‘Dog Owner’s Meet’ given the large numbers of canines in existence – but my kids thought it was superb and spent most of the time debating between themselves which types of dog they would prefer and what they would be called. It served a great purpose as a point of distraction from the usual grumblings of, ‘are we there yet’? I did remind them that the prospect of a dog in the household would probably be the final straw for my 20 year old cat (yep – she’s still here), which then triggered a whole barrage of sarcastic comments from my husband who has never been particularly keen on the feline variety and saw it as a potential opportunity. Suffice to say, we won’t be looking at a canine for the foreseeable future ……. 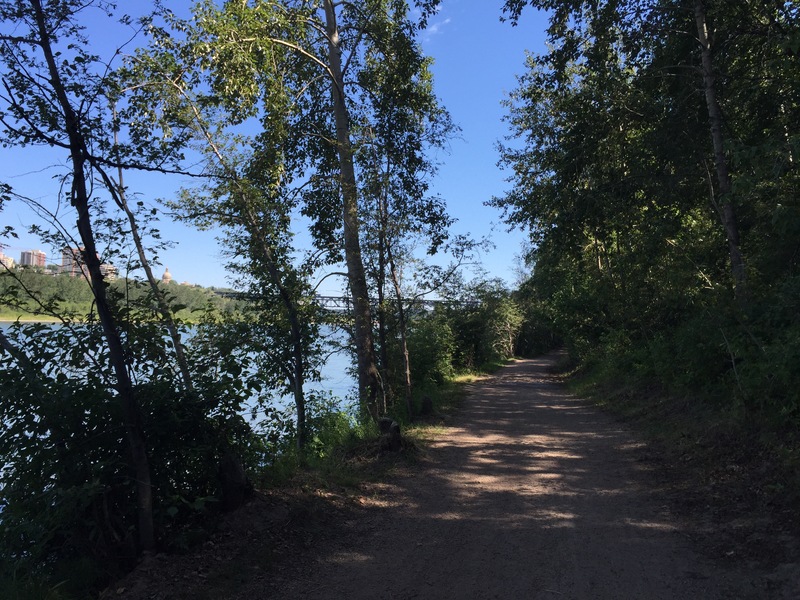 Edmonton has designed numerous ‘Community Walking Maps’ which are available online and cover most of the Edmonton area and River Valley separated into individual communities. Designed to encourage activity (something the Canadians absolutely excel at), each map has lots of different walking routes, things to see and what to do. 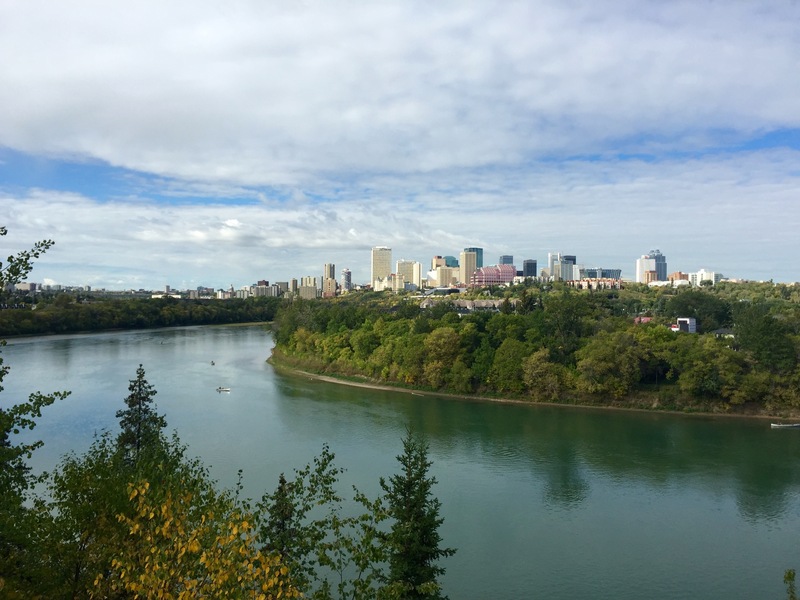 Whilst you could be forgiven for thinking Edmonton a smaller city, the scale of the area and distances is deceptively large – and with it the opportunities to do more things and experience additional stuff, much greater. A bit like being in Northern England, everyone says hello and is extremely friendly. If you visit the most popular parks then you’ll see many more people – but this is still only a portion of the volume you would get compared to going for a walk in the UK. 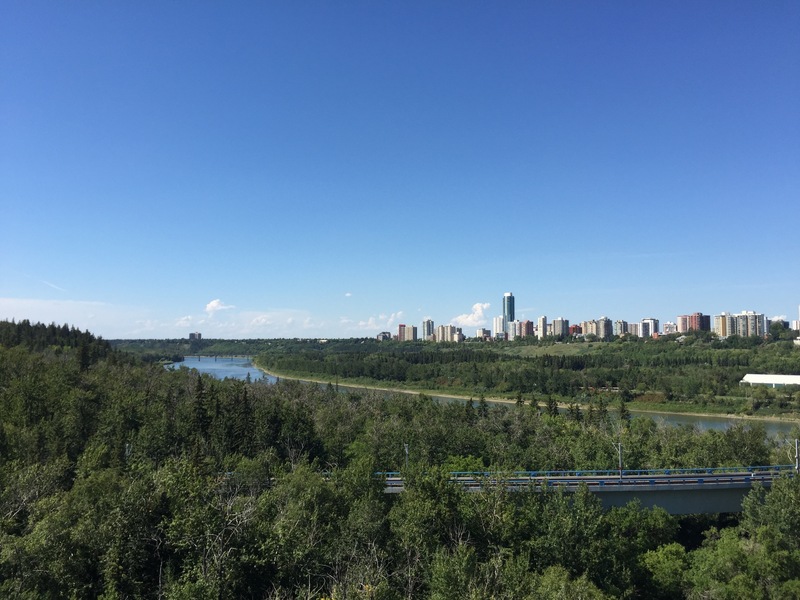 It’s not surprising to only meet one or two people when you’re out for a walk, such is the scale the River Valley area covers across Edmonton. 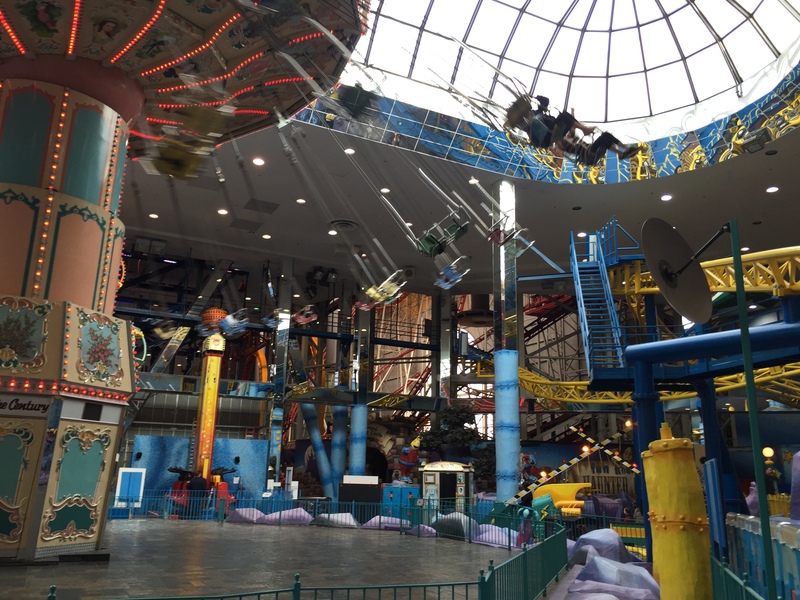 At the end of my last blog, I mentioned a trip to Galaxyland …. the largest indoor amusement park (cue Jeremy Clarkson) … in the world (click here for the pre-amble). 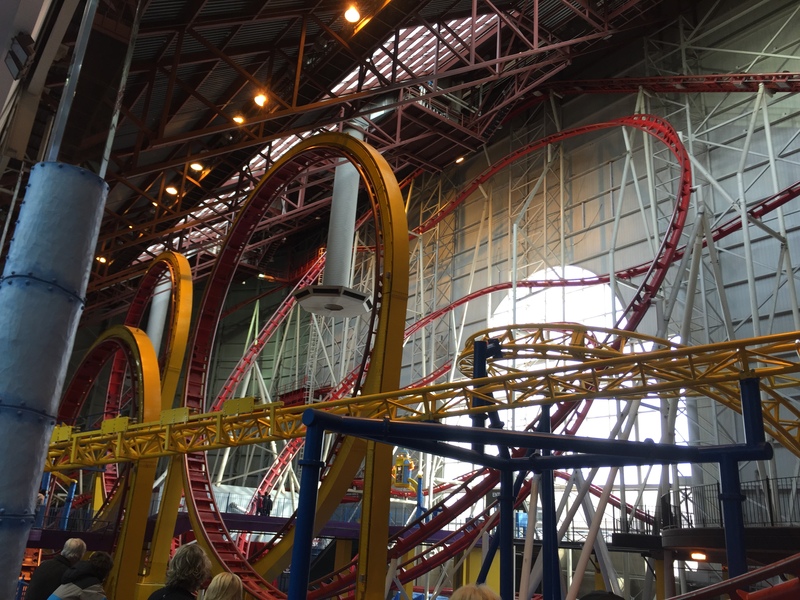 Situated within West Edmonton Mall (largest shopping mall in the world until 2004, and now only the largest in North America and 10th in the world), it has 24 rides and covers an area of 400,000 sq ft – all packed together under one roof. 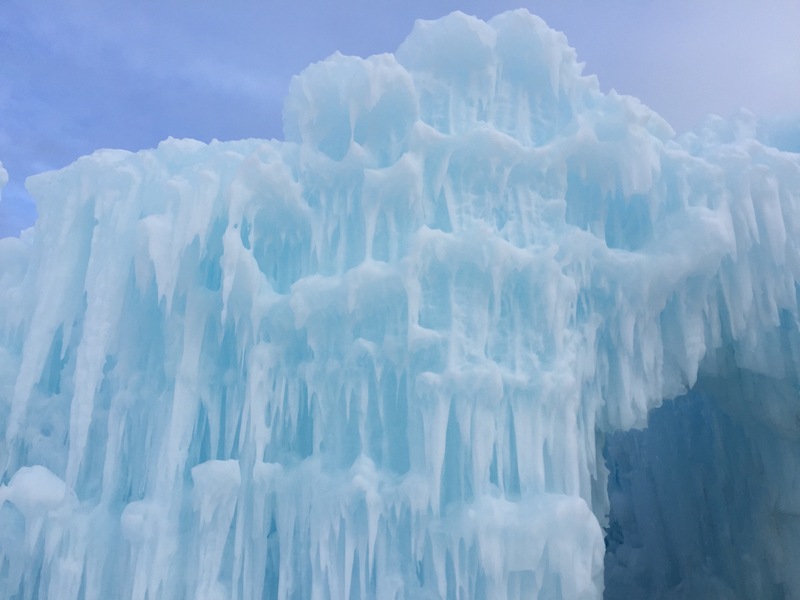 The one roof is pretty key, as when the temperature outside is a blistering -25, you seek the warmth indoors and being able to enjoy the rides without the fear of frostbite or ice freezing up the equipment. It is home to the world’s tallest (14 stories), and longest indoor roller coaster, the ‘Mindbender’. It is also home to the ‘Space Shot’, the world’s tallest indoor tower ride (12 stories high). Now, just to put this whole mall into context, it also hosts the ‘World Waterpark’, the second largest indoor waterpark in the world and the world’s largest indoor wave pool. 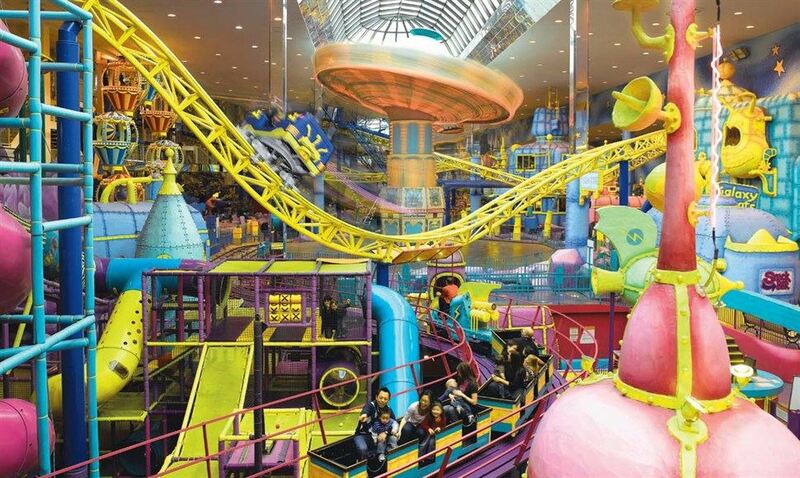 It has a full size ice skating rink, multiplex cinema, sea-life centre, Fantasyland Hotel, and by the way, over 800 stores. Receiving in excess of 32.2m visitors every year, you can safely say it’s huge. 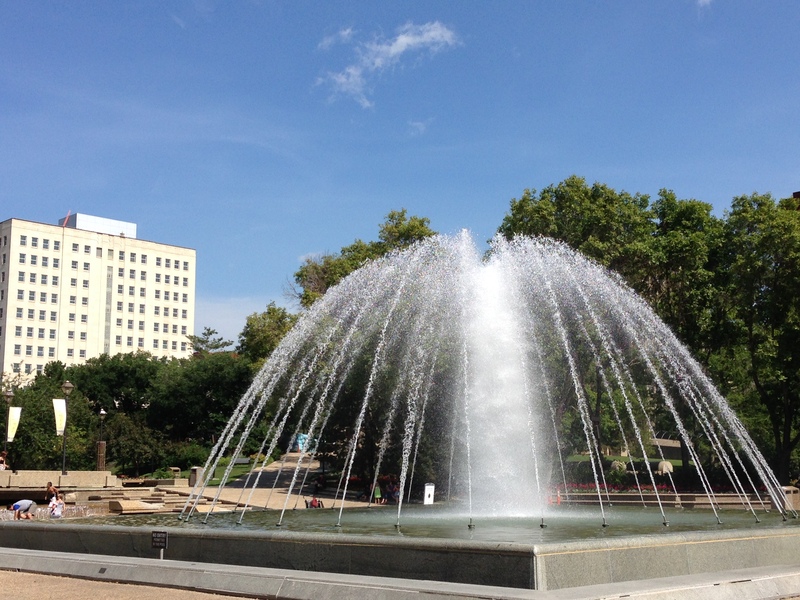 You would also think it busy – and according to Edmontonians, it is. The Mall itself receives 32.2m visitors every year which isn’t a small number. 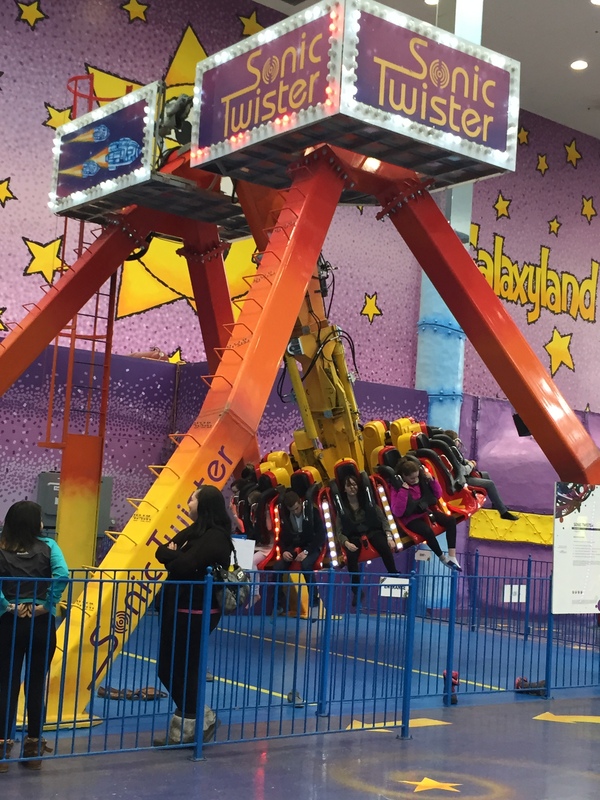 But to someone who comes from the UK and upon any visit to an amusement park, whether in the UK or Florida, the meaning of ‘busy’ entails most of the day spent queuing for rides for the delight of a few moments experience – our trip to Galaxyland was positively quiet. This was brilliant, as we could get straight onto each ride without even a single queue – the most we spent was when it got truly busy in the mid-afternoon and delayed us by having to wait a whole 5 minutes. Now, don’t get me wrong, I’m sure if anyone else takes up the mantle and upon their visit is met by all 32m visitors arriving on the same day – please don’t blame me. 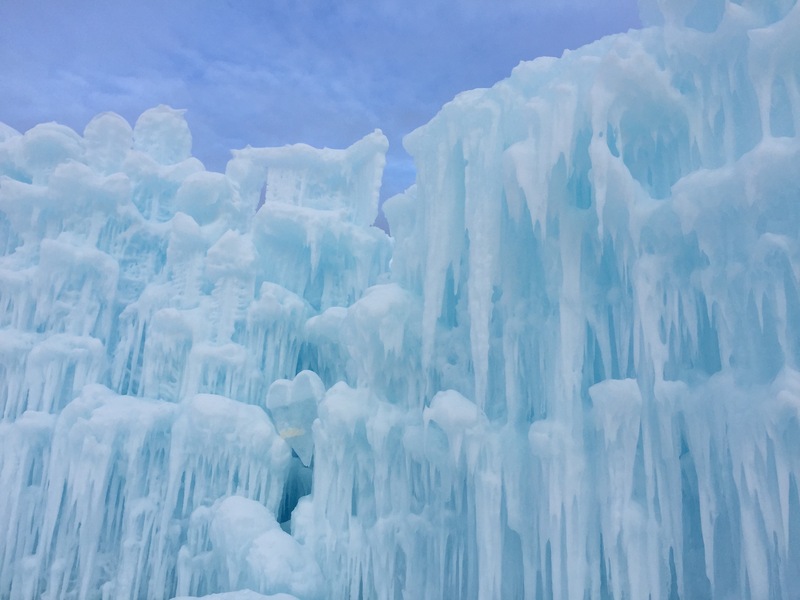 The kids loved it – and I’ve got to say, not being one for thrill rides as a rule, I quickly got into the swing and partook in all except the truly hair-raising and petrifying experiences. These, I left to my 11 year old kid who sprinted onto both the ‘Mindbender’ and ‘Space Shot’ time and time again, by herself. For those with toddlers – this is equally catered for. I did think these would appeal to my youngest kid, who at 5 years old, hasn’t had that many experiences of large rides and I suspected would find the prospect of these pretty daunting. I was proved wrong, and she refused to entertain anything simplistic – opting for the ‘Intermediate’ level rides and anything she was just about tall enough to gain entry on. It was hilarious, as her squeals of terror/laughter as they careered through the park, made me and my other kids break out into fits of giggles too. Never quite knowing whether she truly enjoyed it or not, the test seemed to be at the end when the ride eventually stopped. If her immediate response was met by the shriek, ‘again’, back we went on the same ride. The one downside with it being indoors, is that you don’t necessarily get the scenic views like you would at the top of the Pepsi ‘Big One’ in Blackpool. That said, the number of rides which have been packed cleverly inside this cavernous space was brilliant. I was left marvelling at the science which must have gone into positioning each and every ride so they don’t hit one another! Galaxyland is a great proposition. Where else do you get something that caters for everyone and all their tastes. Whether or not each family member takes to the rides, those that prefer the ‘retail’ experience can opt to hit the shops which are next door. The food eateries are too numerous to mention, and the range of food on offer equally so. Best of all, it’s only 15 minutes drive from our house so I’m guessing we may be visiting it on a regular basis. No one said an orientation visit would be a ‘holiday’ but we’ve been hard at it for the last 5 days. Aside from our ‘research’ into the emergency Children’s Hospital (see last blog), we’ve covered a lot of miles both on foot and in vehicle. 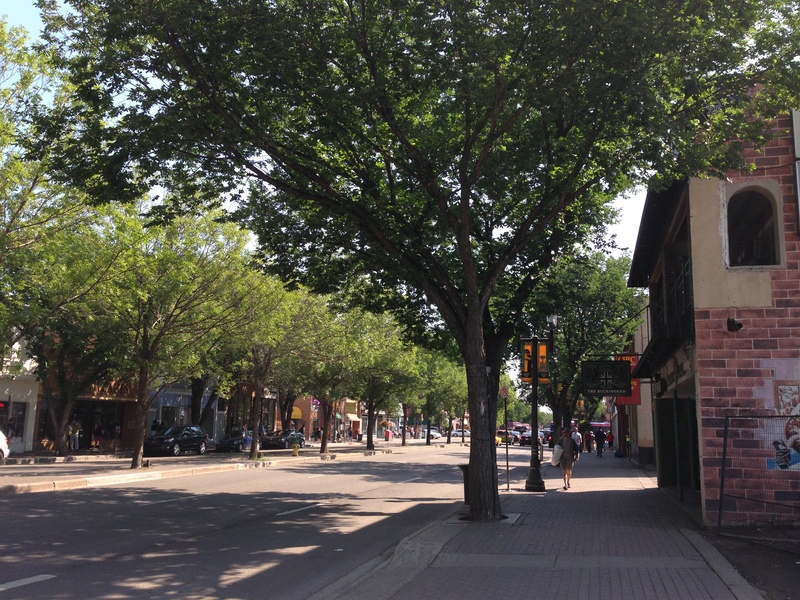 The city of Edmonton is beautiful – downtown is compact and everything is within easy walking distance. Whilst we’ve been extremely lucky and have had blue skies and sun for the vast majority of the week – always over 22 degrees – there’s no doubt that the winter when it arrives is cold and long. There are ‘pedways’ linking all the areas downtown such that you never need to go outside and can easily walk from one area to another – essential in bad weather. The majority of car parking is underground and in various ‘parkades’ around the city. 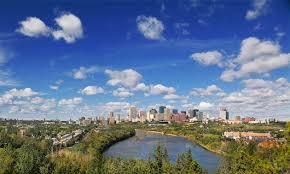 However, the best feature is the people who are extremely friendly, welcoming and above all, positively glowing about life in Edmonton and it being the best place on earth to live. 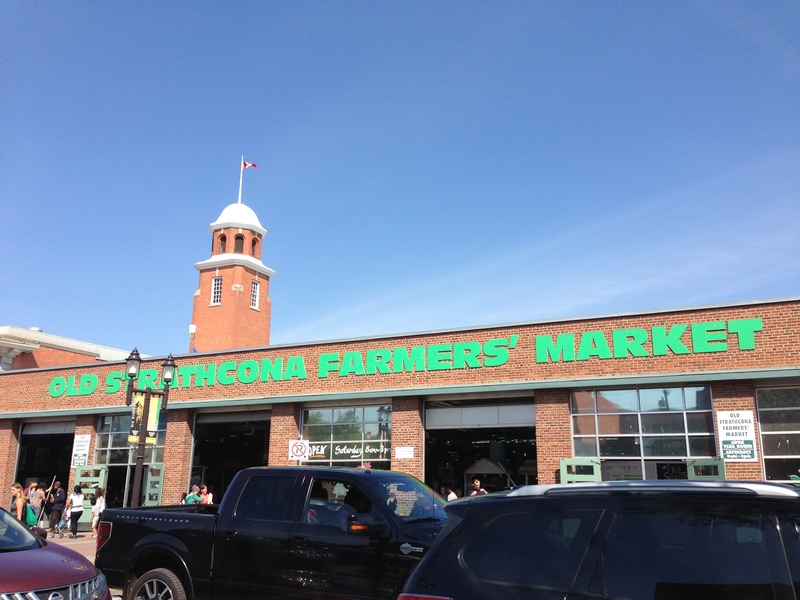 We’ve visited Old Strathcona, a beautiful part of the city where the Farmers Market which is held there every Saturday will be an absolute must. Full of freshly grown produce, home made relishes and jams, honey, fresh bread, cheeses and hand turned wood carvings – the list is endless – the atmosphere is one of fun and welcome. 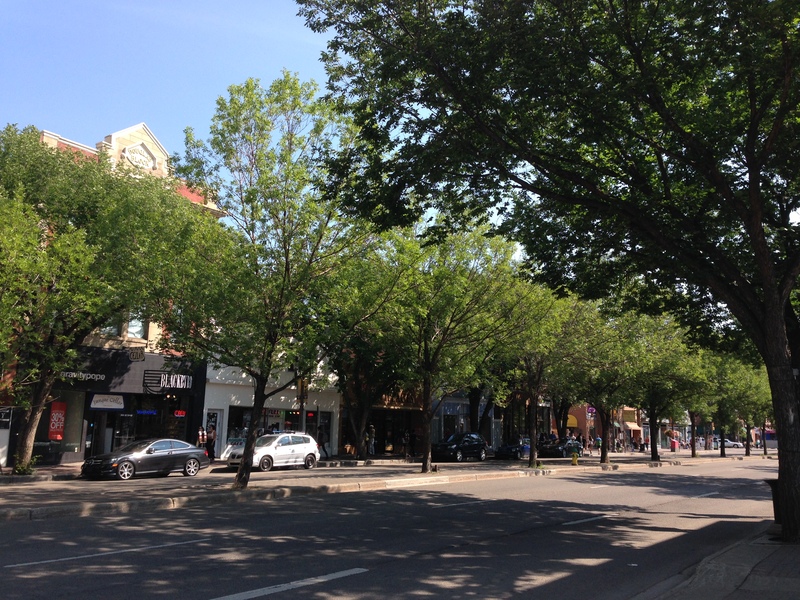 The main street ‘ Whyte Avenue’, is strewn with artisan shops and cafes. 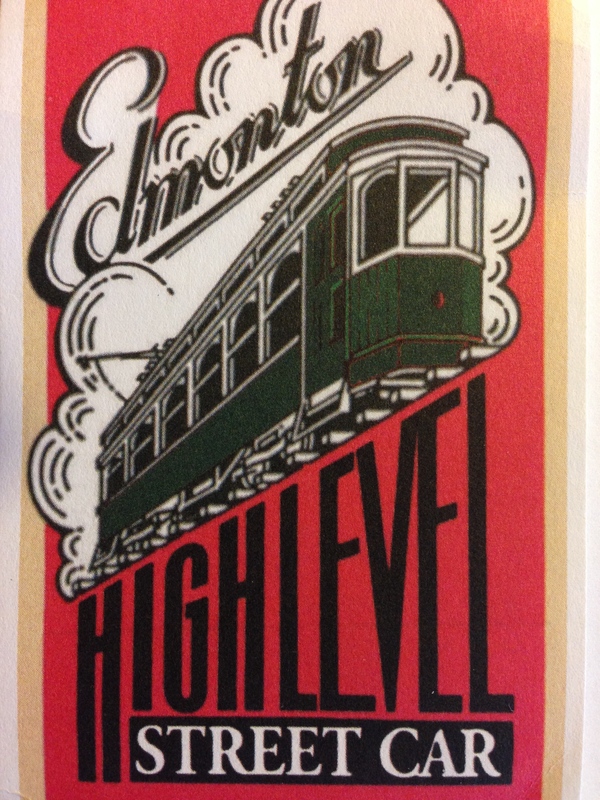 There’s a heritage trail you can walk around and the high level streetcar which operates on the original Calgary to Edmonton ‘right of way’, passes many historic sites and is the highest streetcar bridge in Canada. 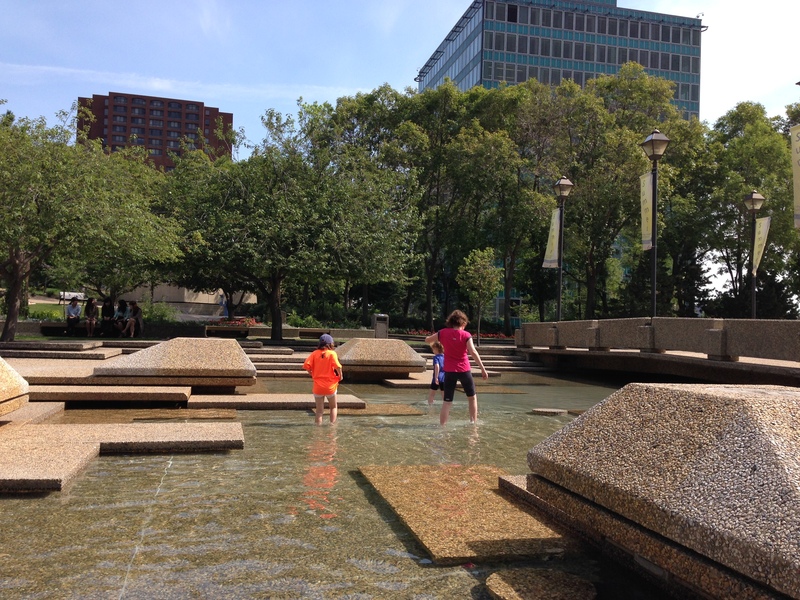 There are fountains of water for paddling and splashing during the summer throughout the city, and these turn into ice skating rinks during the winter. It truly is beautiful. By car (we hired a Grand Cherokee which is huge by UK standards), and navigated our way around all the main suburbs and regions of Edmonton. We found areas where we’ll be targeting for houses to either rent or buy – we haven’t decided which yet – and all have immediate access to woodland, parkland and leisure facilities. We stumbled across some water parks which, given the fantastic weather, had children screaming in delight at the water jets and mini fountains they could play on. We don’t have anything like this in the UK – well, not that’s free – and these are dotted all across the city here. We were staggered that there were no entry fees of any kind, and even on a busy day, they weren’t overcrowded. Everything is highly maintained, attractive and fully functional. It’s probably stuff that people in other countries don’t even consider, but it’s such a welcome feature after living in the UK all our lives that I can’t wait to embrace. The kids can’t either! 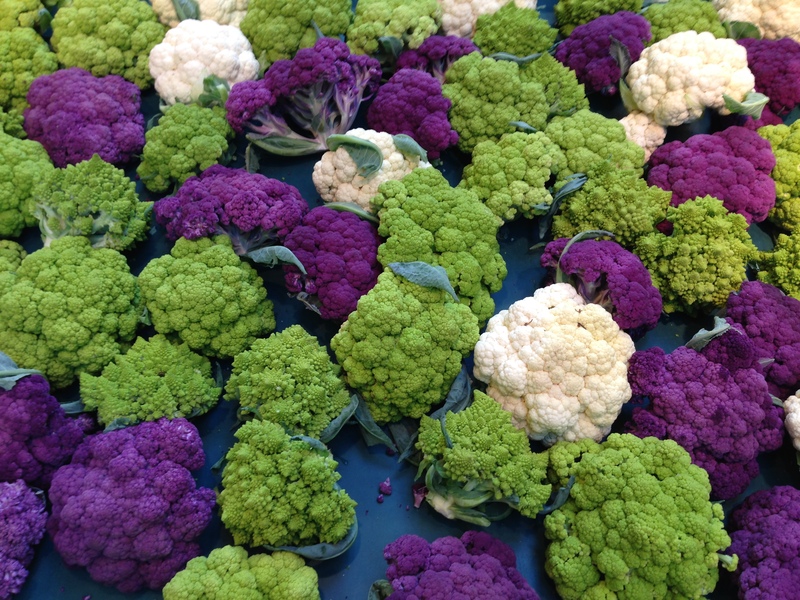 Food wise, there’s loads of supermarkets and the farmers markets which provide direct produce and all the required essentials. We even spotted ‘English Mustard’, so the panic is over and we’ve identified where we can source this from without importing direct from the UK! Like in America, there is an abundance of fast food, high sugar, high fat and massive quantities on offer. It’s hard to find healthy food quickly and in small portions – all the more difficult when we’re staying in hotels too. That said, we’ve had some exceptional meals. The beef is superb – both in taste and texture. We’ve had bison burgers – lean and mean. A chinese meal that was completely different to that offered in the UK – but the best I’ve ever eaten. The flavour and range on offer for the main dishes was staggering and all the ‘kids’ declared this the best meal of the trip so far. The restaurant was in an unassuming building a few blocks away from where we’re staying, and not somewhere you would naturally think of venturing into. However, once through the door, it is a cavernous building decked in all manner of chinese adornment, and to add more spice, it turns out that the chinese ‘hosts’ have their own reality programme on Canadian TV which has won various awards – no wonder it was busy! Worth the experience certainly! So, a superb 5 days and we all feel ready to embrace the Canadian life in Edmonton. Off to Jasper and the mountains tomorrow so we’re looking forward to seeing some hills, some snow and wild animals.